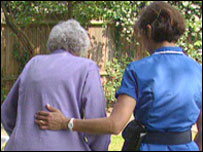 Older people in Wales are more likely to face abuse than in any other UK nation, a government survey has shown. The two-year study revealed that thousands of older people are being physically, sexually or psychologically abused, usually by their own relatives. Charities have called on the assembly to fund research as to why elder abuse levels are higher in Wales. The project examined abuse in domestic settings only and did not survey older people in hospitals or care homes. People with dementia were also not questioned. The incidence of elder abuse in Wales was found to be 6% compared with 4.2% in Scotland, 3.9% in England and 3% in Northern Ireland. The scale abuse was described as "quite staggering" by the charity Action on Elder Abuse (AEA). Of the types of abuse across the UK, medication misuse was a major problem as was the neglect of older people. In many cases the survey found that older people were being left in bed, unwashed, left without food or access to the toilet. Two-thirds of abusers were found to be family members and 10% were domiciliary care staff. Twenty per cent of theft was by domiciliary care staff. AEA called on the Welsh assembly to give the same level of priority to the abuse of adults as it does with children. It also wants AMs to commission further research to understand the cultural and social differences that cause the nation to experience abuse at a higher level or differently. Age Alliance Wales, a collaboration national of voluntary organisations concerned with ageing in Wales, believes the study could have "real significance" in the fight to combat elder abuse in Wales. Its own research has found that one in five people in Wales are aware of an older person who has experienced some form of abuse. It also urged the assembly to build on the research and use its powers to form legislation that would protect older people in all care settings. The Alliance's chair Robert Taylor said: "Wales has the highest proportion of older people in the UK and, crucially, has more than 20,000 older people living in residential and nursing care, many of whom are not afforded protection by the Human Rights Act. "We know that comparatively few cases come to the attention of the local authority, so it is important for us to have more information as to what prevents people from reporting abusive situations."